Thanks to Bluecanvas for sponsoring this review copy. 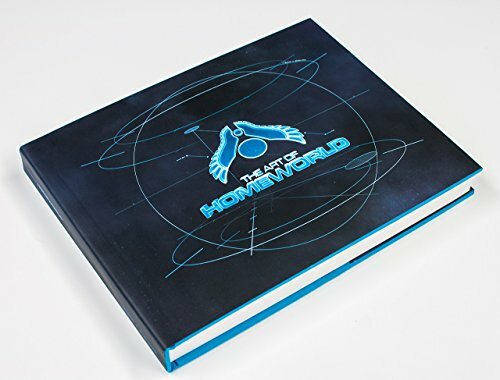 I find it quite surprising to see an artbook for Homeworld as the game was released back in 1999. In 2014, Homeworld Remastered Collection was released so I guess there's still a huge fan base around the game. This gigantic 236-page artbook is published by Bluecanvas, the same publisher who published The Art of The God of War: Ascension, The Art of Journey and Blackwater Archives | The Art of The Order: 1886. They are all wonderful video game artbooks that I've featured in the past. The production quality of the book is excellent. The paper is the thick and non-glossy type. Binding is superb for a book this thick. The artworks featured are from the last 10-15 years. The game is of the space sci-fi genre so the bulk of the art are of spaceship designs. You'll get to see the many technical line drawings for the spaceship design. There are also some coloured and grayscale artworks, 3D artworks and some animatics scenes. The artworks are printed delightfully huge and are crisp looking. There are only a few pieces of environment art, and even those are like filled up with mainly spaceship designs. As for the content, it covers Homeworld 1 and Homeworld 2. For Homeworld 1, there are the Kushan, Bentusi, the Turanic Raiders, Kadeshi and Taiidan. Homeworld 2 has the Hiigaran, Vaygr and Progenitors. There are interviews with co-founders of Blackbird Interactive Rob Cunningham and Aaron Kambeitz who talk about the game studio and also provide commentary to the concept art featured. This artbook is expensive but that's to be expected looking at the production quality and thickness of the book. Overall, this is another quality artbook from Bluecanvas. Highly recommended to fans of Homeworld and sci-fi art.